… and Dad = Water. Well, that was an easy exercise. Now here’s my rationale: Fire scorches Earth, but is extinguished by Water. Conversely, Earth could put out Fire, but it’s not as fast as Fire. Fire is fed by Air so… being who I am, and my brother being who he is, and Mom and Dad who they were, it’s a formula I can get behind. At least it sounds reasonable enough. Every late spring, we “put in” the boat dock. Putting in/taking in—I must’ve meant putting the dock in, although sometimes our old wooden dock would be split to pieces by heaving spring ice, so I might’ve meant that it had to first come out. Later, Dad bought a dock setup with metal stakes that he’d pile-drive deep into the lakebed. Down at the boathouse is where Dad was happiest. 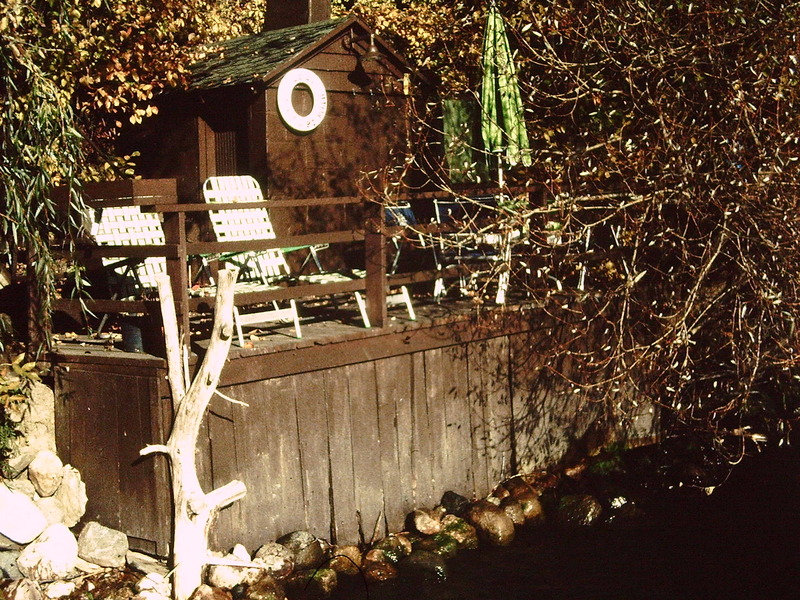 Guess I never realized how much time and love he put into making everything just so: repainting the boathouse, building a deck for lawn chairs, adding a small, shaded table and a workbench for cleaning fish. Dad made sure the embankment was re-enforced—we kids were always scrambling up and down it, wearing away the soil and surrounding plants. Inside the boathouse, it was dank, musty, and stank of boat motor oil and gasoline. There Dad hung his fishing poles, rods, and stowed his tackle in a bulky steel box. If the weather was good, he’d hurry home early from his university office just to get in some fishing after supper and before bedtime. Or if pressed for time, he was content to fish off the dock. But I think he was happiest in a boat because it put him closer to the water, right on its level, the air filled with spray all around him. It was often a joke with the neighborhood kids—“Hey Maupin! Saw your Dad out looking for the Loch Ness Monster!”—since he’d always be standing lookout as he sped across the bay. 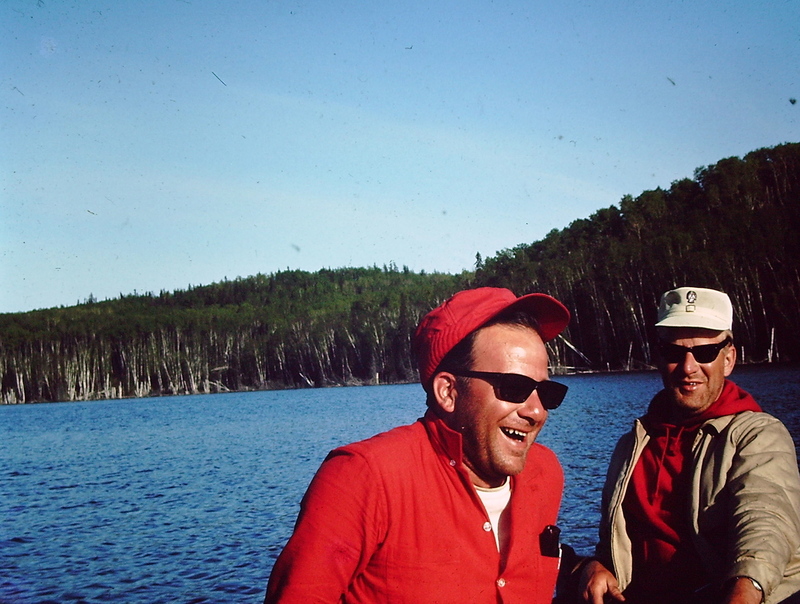 Dad’s favorite fishing spot was a quiet lagoon just off Phelps Bay on Enchanted Island. 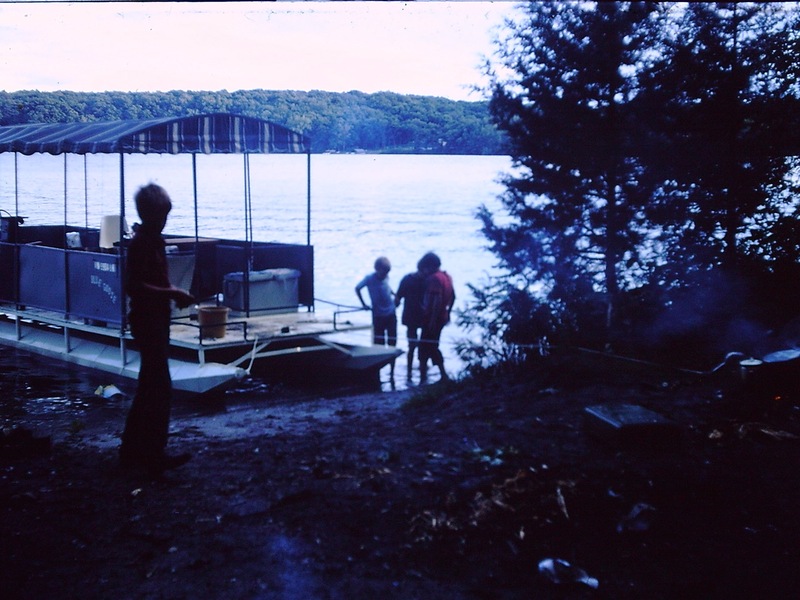 Sometimes we took a pontoon boat he dubbed “The Blue Goose” to Boy Scout Island and camped for the night (photo below right from early 1970s). I didn’t fish with him very often—scarred from an early age, as I’d get too impatient and distracted while fishing, which thoroughly annoyed him. 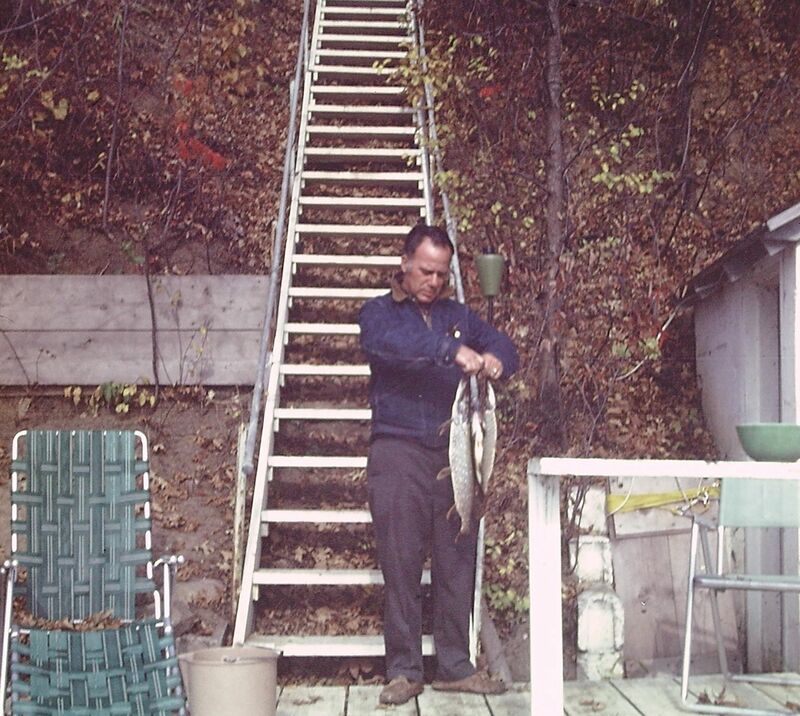 And while I may have never shared Dad’s love for fishing, just because he was so fully absorbed by it I came to respect it. I definitely saw the attraction of being on the water, being in nature. Those were simpler days—those summers on the lake—down at the dock or out camping on islands and night swimming. With it brings a flood of memories of tall, mountainous cumulus clouds, glinting shards of sunlight off rippling waves, the rhythmic slurp of beaching waves, birds chirping from trees, fish slapping the lake surface, the drone of distant boats. You know, if there is an afterlife, and it’s a happy one for Dad, I know it’s somewhere near water. ~ by completelyinthedark on April 19, 2013. My dad and I used to go fishing all the time. I actually miss our quality time.